General Mills has a new offer! 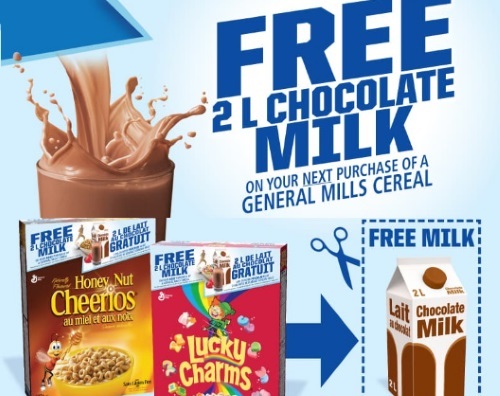 Get a Free 2L Chocolate Milk on your next purchase of a General Mills cereal! 1. Purchase a specially marked package of General Mills Cereal (participating products include Yellow box Cherrios 525g, Multi-Grain Cheerios 560g, Honey Nut Cheerios 685g, Lucky Charms 580g, Cinnamon Toast Crunch 600g). 3. Redeem your coupon with the purchase of a participating General Mills cereal and get your 2L Chocolate Milk for Free.